Use a different KOOL-AID flavor every time you make this classic summertime treat. Place granulated sweetener and drink mix in large plastic or glass pitcher. Add water; stir until drink mix is dissolved. Stir in juice cocktail. Use immediately or refrigerate until ready to serve. Pour 3/4 cup of the prepared drink into each of eight tall glasses. 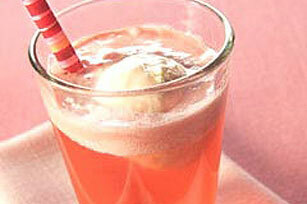 Add 1/4 cup seltzer to each glass, then top with 1/4 cup of the ice cream. Serve immediately. Store leftover prepared drink in refrigerator. Makes about 2-1/2 qt. or 8 servings, about 1-1/4 cups each.